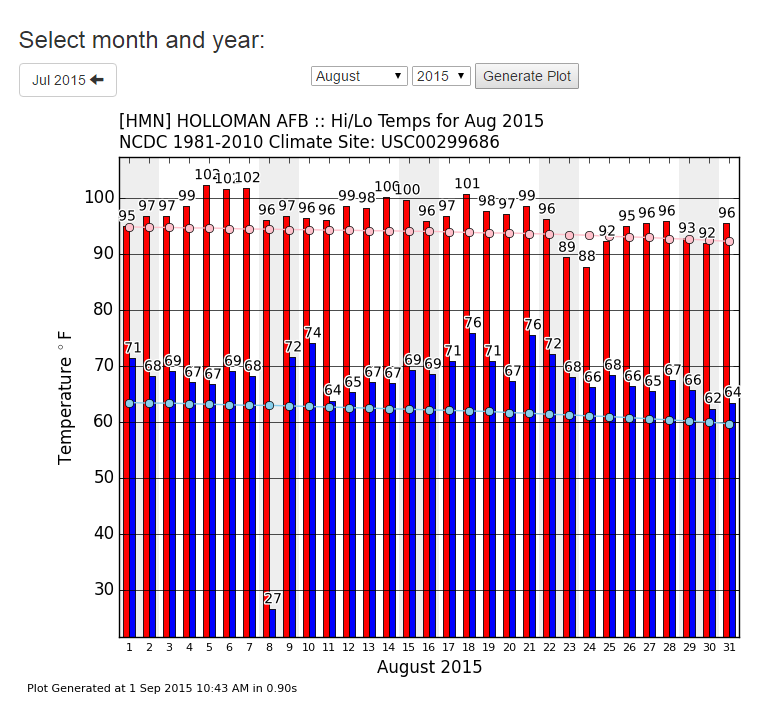 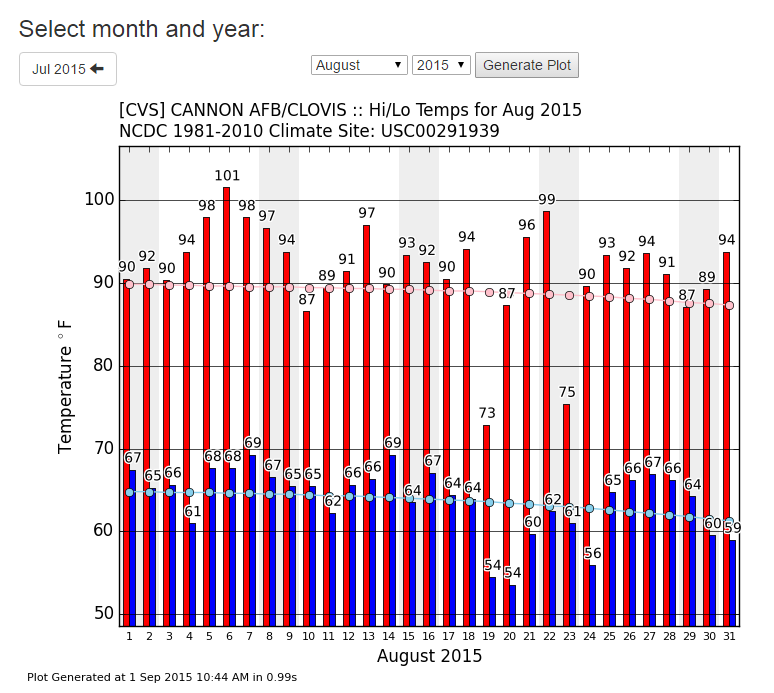 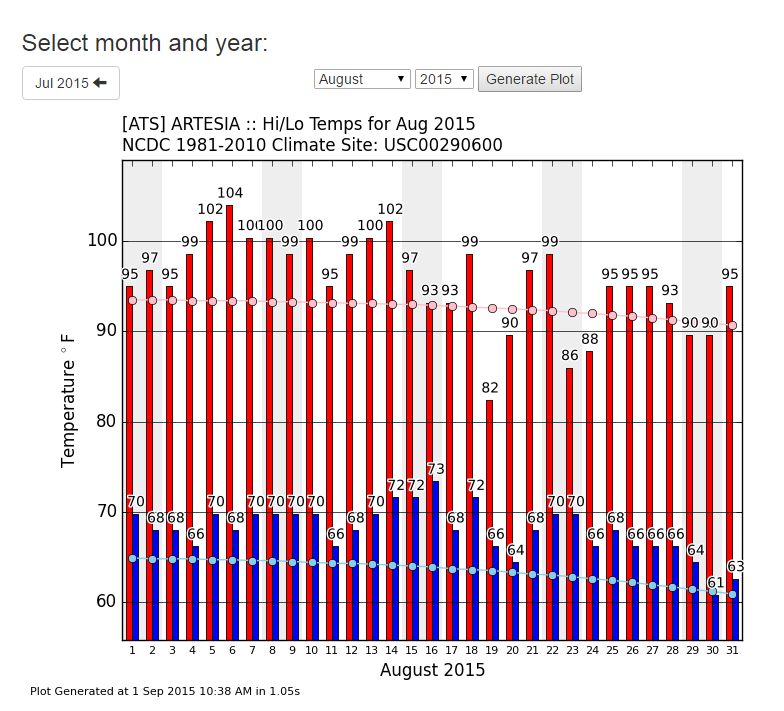 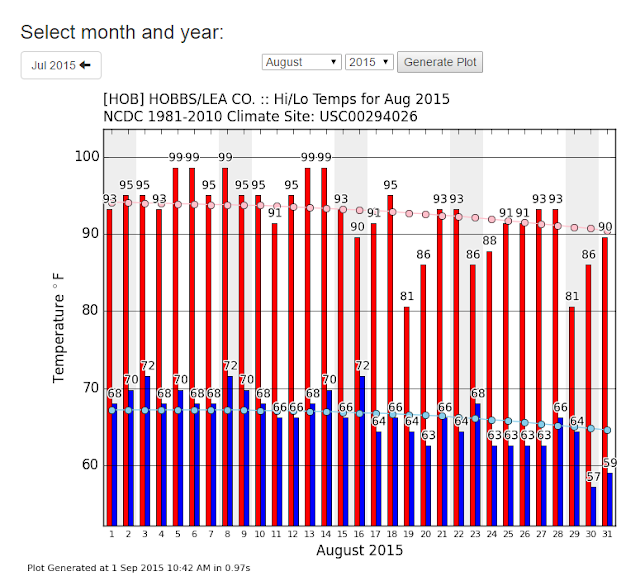 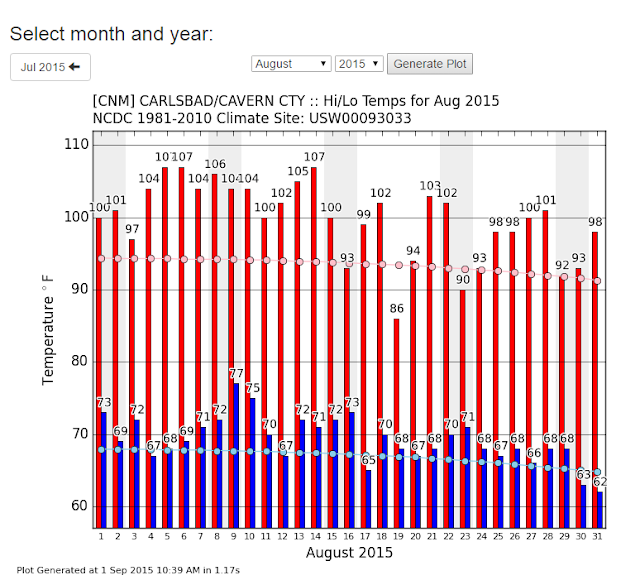 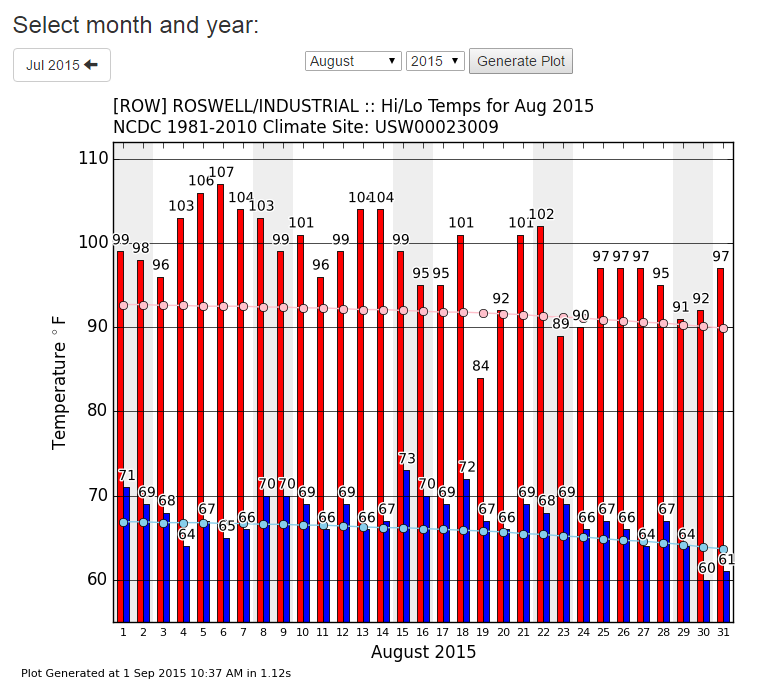 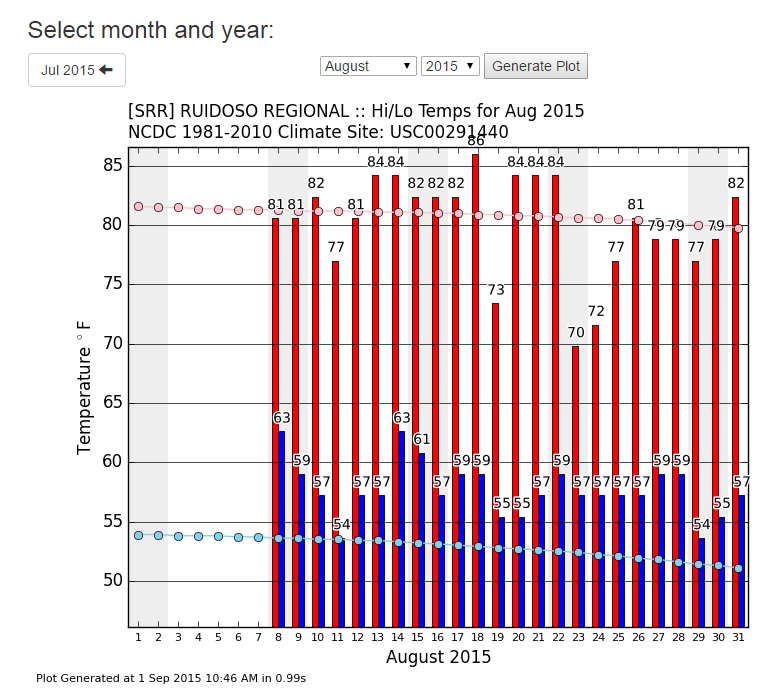 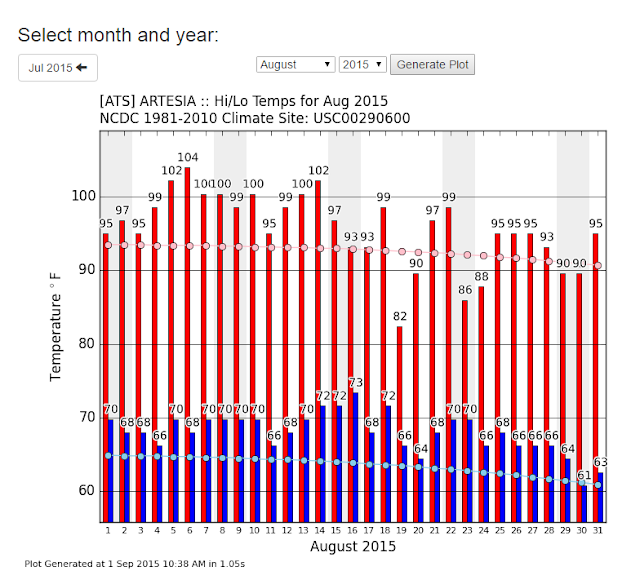 August 2015 Temp & Rainfall Data. 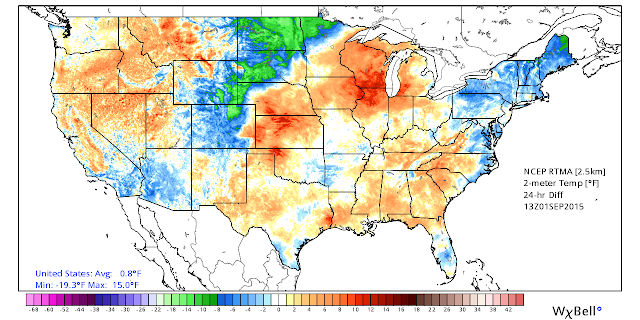 Blog Updated 7:30 AM MDT (-2-2015. 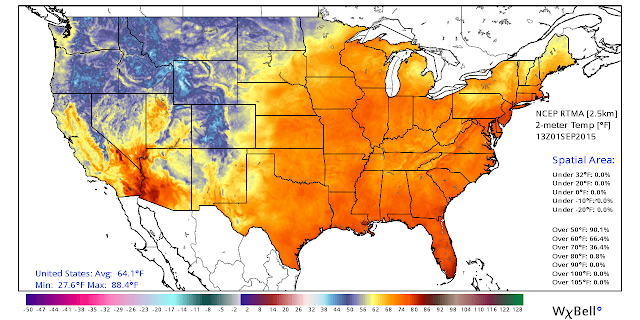 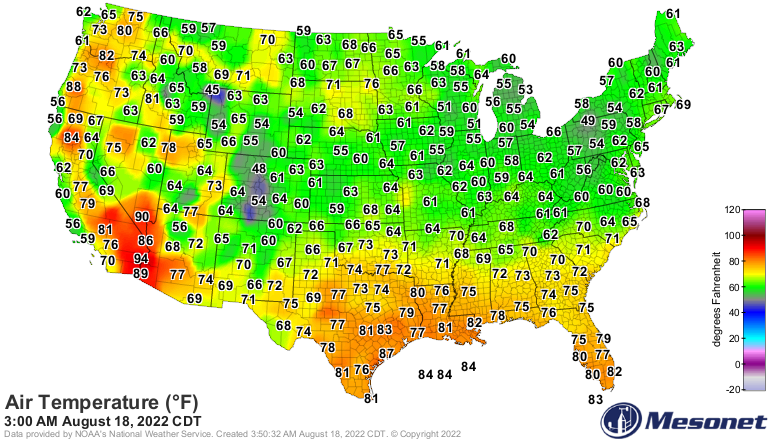 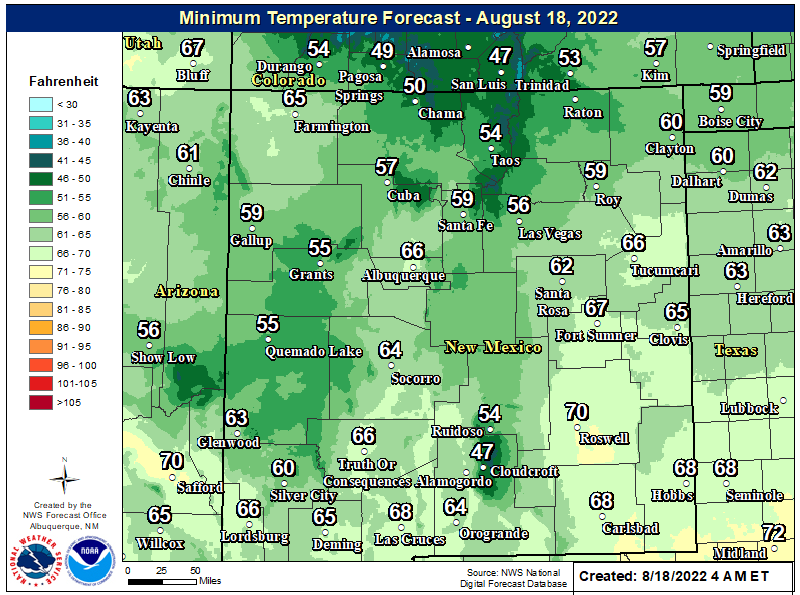 24-Hour Temperature Difference @ 7 AM MDT This Morning. 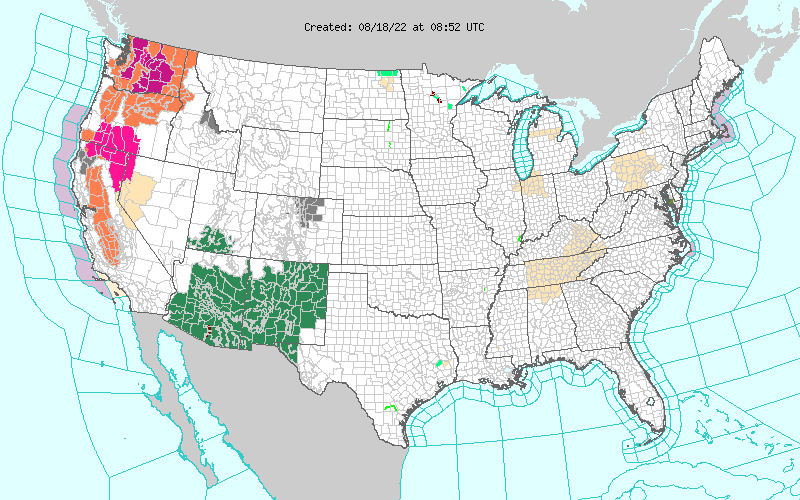 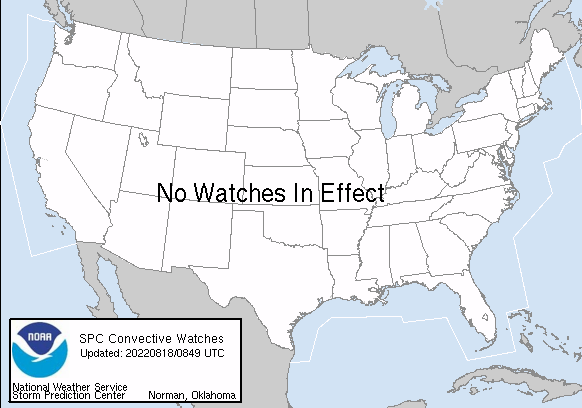 Welcome to the first day of the meteorological fall. 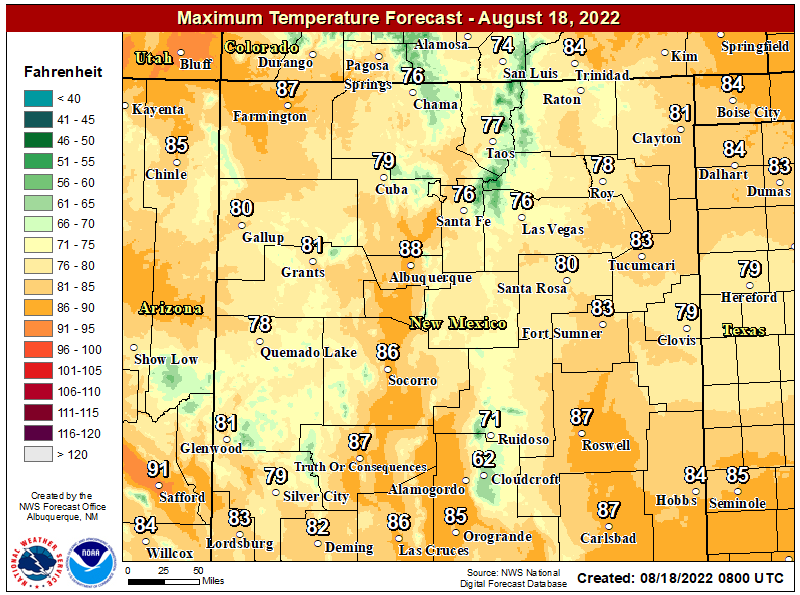 However today will fill more like summer than it will fall with our local high temps forecast to be in the 90's. 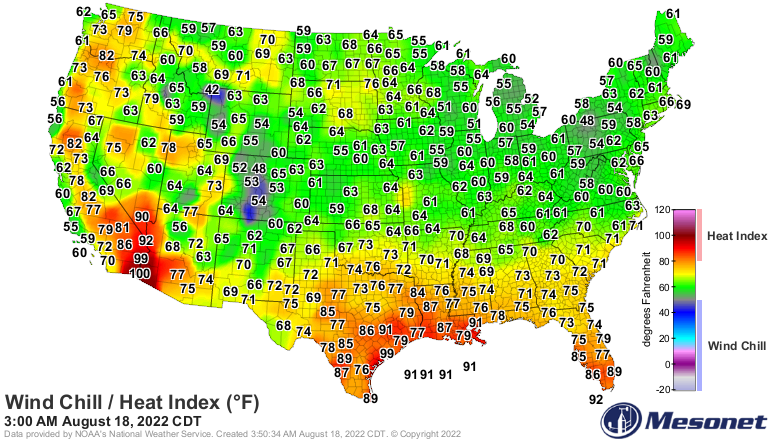 Our overnight low temperatures are slowly starting to come down. 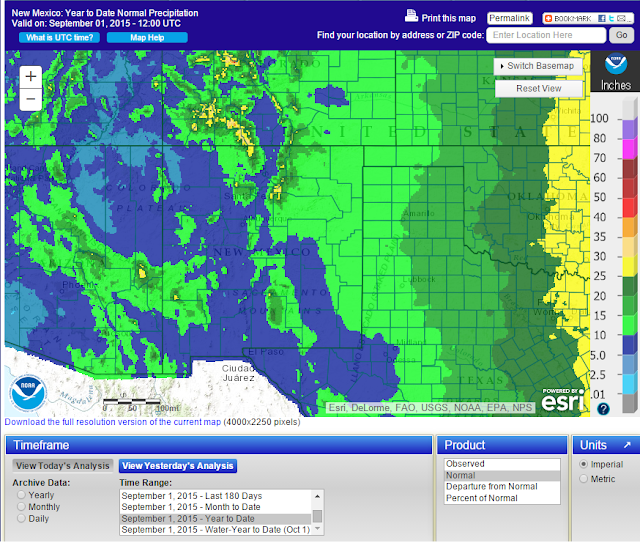 In the past week we've seen a few upper 50's to low 60's across the southeastern plains. 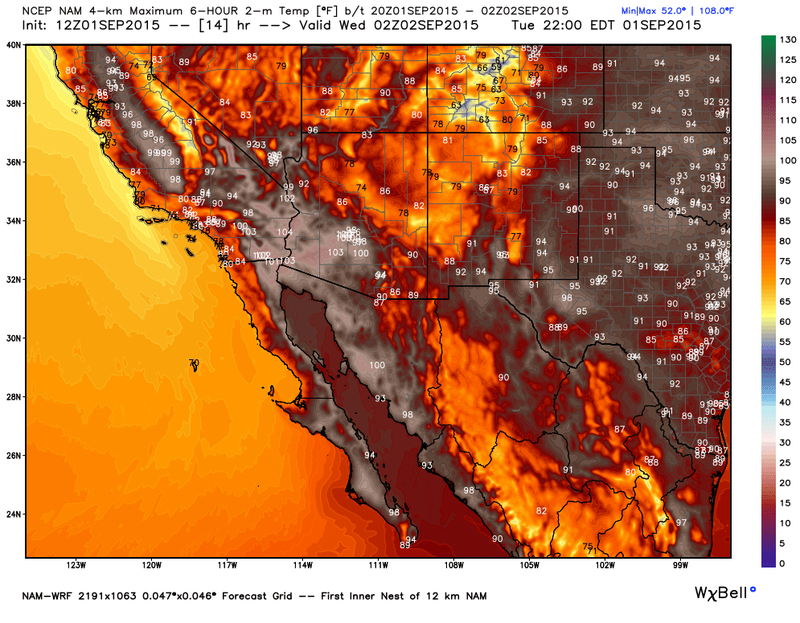 12Z/6 AM MDT NAM-WRF Forecast High Temps Today. 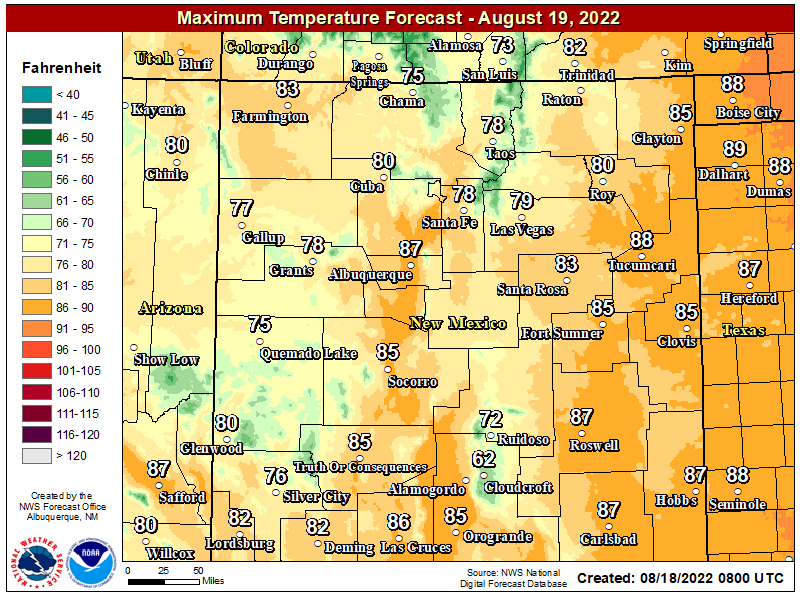 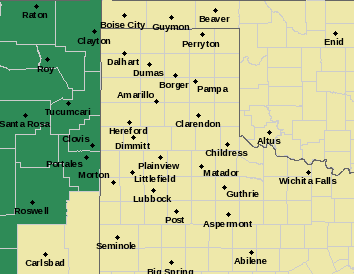 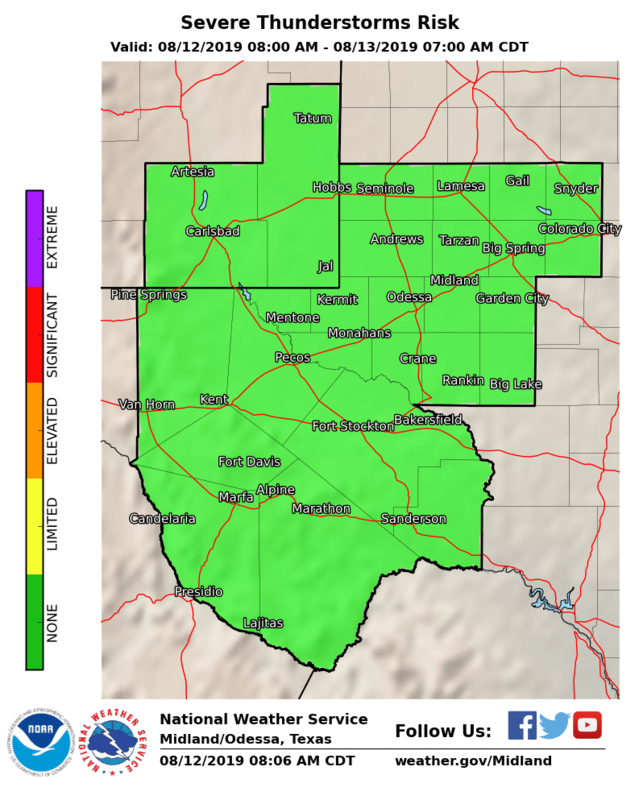 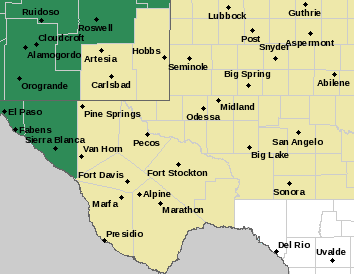 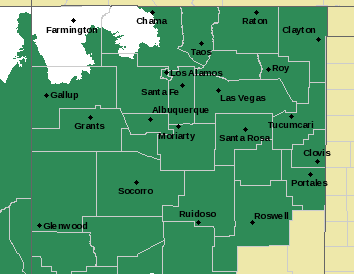 Valid @ 6 PM MDT. 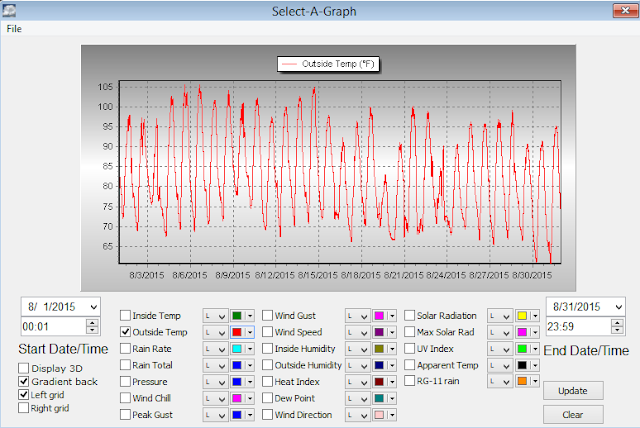 My Davis Vantage Pro2 Home Weather Station Temperature Plot. 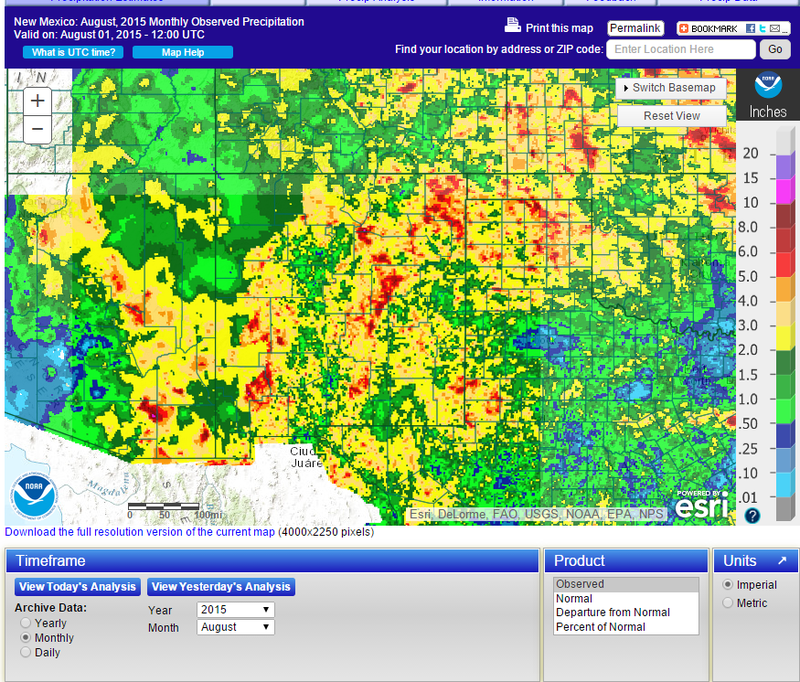 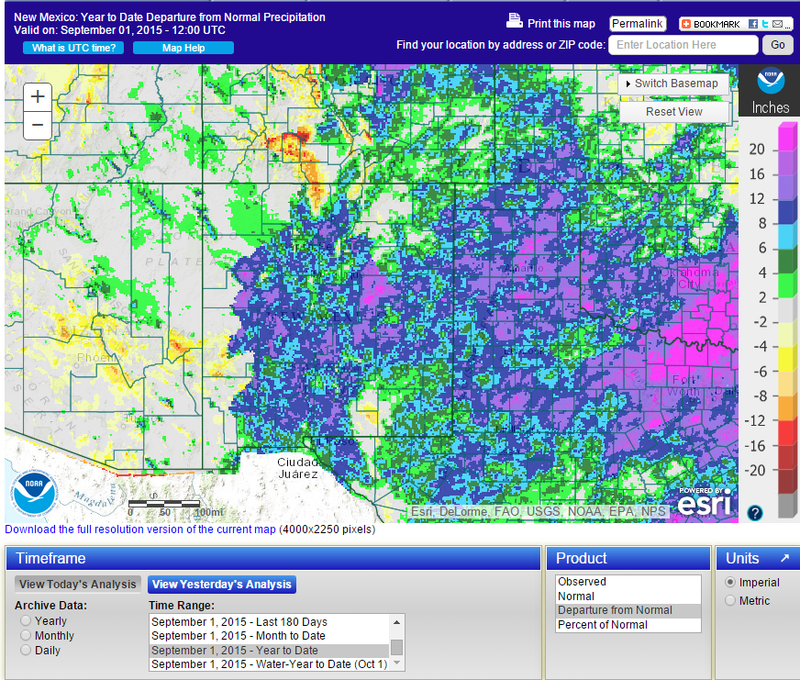 New Mexico August 2015 Rainfall Totals. 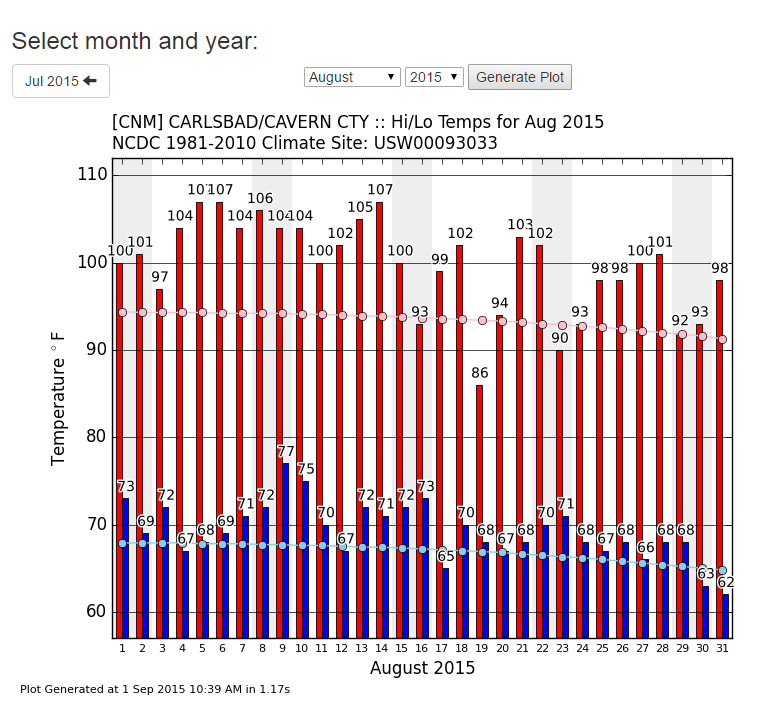 Here at our home in Carlsbad I ended up with 1.42" of rainfall for August which is slightly below the long term average for Carlsbad for August which is 1.78" (1900-2015). 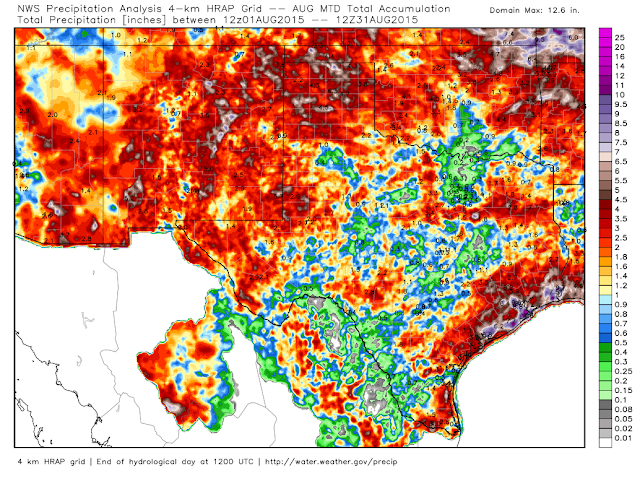 My Year-To-Date Total is now up to 11.68" which is 3.39" above the long term average (1900-2015) January 1st - August 31st of 8.29". 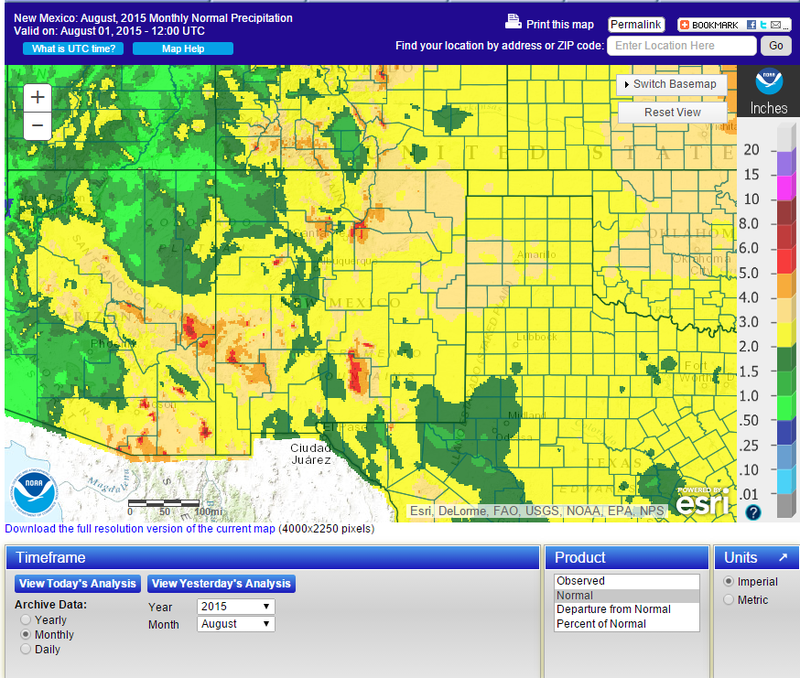 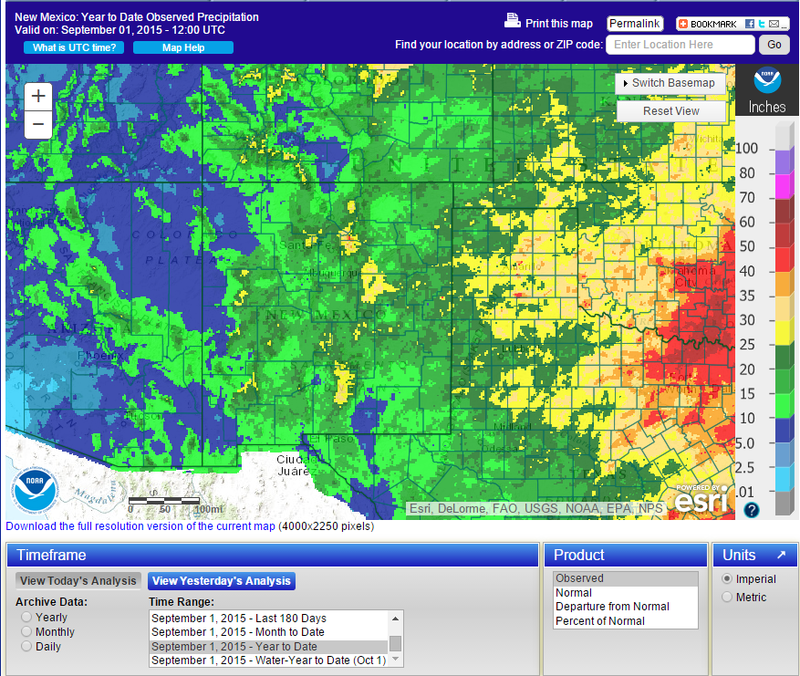 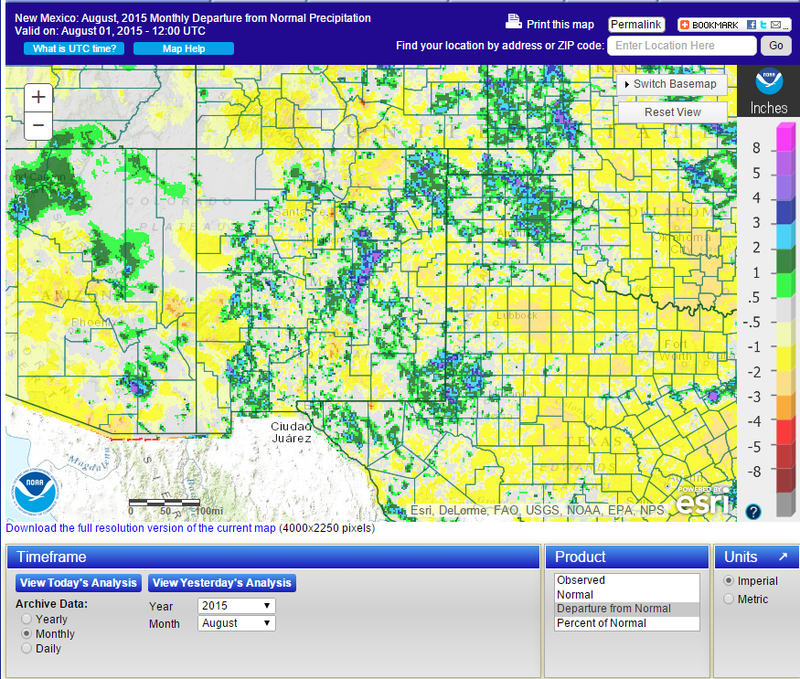 Regional August 2015 Rainfall Totals.